Individuals considering a facelift at 40 may want to act sooner rather than later to achieve their facial rejuvenation goals. Because the longer an individual waits to undergo facelift surgery, the more likely it becomes that he or she may experience deeper wrinkles, frown lines and other visible signs of aging in the face. At the CENTER for Advanced Facial Plastic Surgery in Los Angeles, Dr. Babak Azizzadeh takes a holistic approach to facelift surgery. Dr. Azizzadeh is a globally recognized facial plastic and reconstructive surgeon, and his goal is to help each facelift patient achieve a balanced, natural-looking appearance. He teaches his patients about facelift surgery, and by doing so, helps them weigh the pros and cons of treatment. If a facelift at 40 proves to be the best facial rejuvenation treatment option, Dr. Azizzadeh will work diligently to ensure a patient can get the most out of this procedure. Cheeks: Minimizes sagging and volume loss in the cheeks that sometimes makes a person look older than his or her actual age. Jawline: Eliminates excess skin on the lower jawline. Nose: Treats a drooping nasal tip. Neck: Addresses excess fat and sagging skin in the neck. Eyes: Corrects drooping skin or hollows around the eyes that otherwise result in a “tired” facial appearance. Brow Lift: Treats sagging skin on the forehead. Neck Lift: Eliminates fat deposits and excess skin and tightens muscle laxity in the neck and throat. Eyelid Lift: Removes lower eyelid bags and excess skin from the upper eyelids. Facial rejuvenation surgery helps people in their 40s quickly and safely enhance their facial appearance. However, it is important to note that not everyone is an ideal candidate for a facelift or other facial rejuvenation procedures. To find out if you are a good candidate for facial rejuvenation surgery, you must consult with an expert facial plastic and reconstructive surgeon like Dr. Azizzadeh. During an initial facelift consultation, Dr. Azizzadeh will examine a person’s face closely. He will look for loss of collagen and other visible signs of aging in an individual’s face. Dr. Azizzadeh will also review an individual’s medical history, offer details about different facelift techniques and answer all of the patient’s facelift questions. Dr. Azizzadeh will explain to a patient what results are realistic and possible given their anti-aging needs and goals. This is one of the most important aspects of a great consultation – the surgeon and the patient must both have the same expectations for the outcome of the facelift. To help explain realistic outcomes to his patients, Dr. Azizzadeh utilizes the Aging Arc tool to visualize facelift results before treatment. The Aging Arc involves the use of images to assess how a person’s facial appearance may change as he or she grows older. If an individual falls within the negative range of the Aging Arc, he or she may display facial expression lines and other signs of aging. The Aging Arc helps Dr. Azizzadeh determine which facelift treatments will enable an individual to achieve his or her desired results. This way, Dr. Azizzadeh can offer personalized facelift treatment options to each patient. Although a facelift often is viewed strictly as a surgical procedure, many non-invasive alternatives are available. Thus, an individual should learn about both surgical and non-invasive facelift treatments. What Non-Invasive Facelift Treatments Are Available? Botox: An injectable prescription, Botox has been shown to help smooth fine lines and wrinkles that are caused by excessive muscle movements in the face. 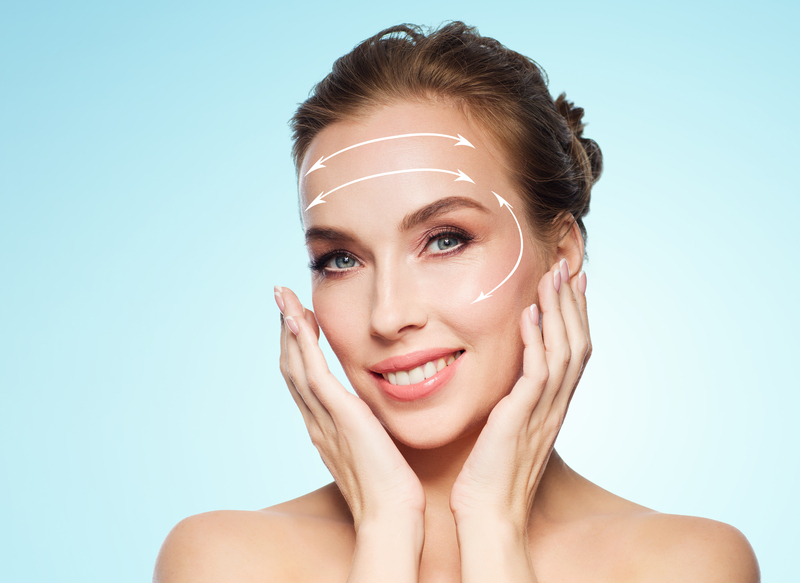 Dermal Fillers: With dermal fillers like Voluma, Restylane and Perlane, an individual can counteract many signs of aging in the face, resulting in a more youthful and vibrant facial appearance. Laser Skin Resurfacing: One of the most popular types of facial rejuvenation, laser skin resurfacing enables Dr. Azizzadeh to pinpoint hundreds of spots per square inch of skin. Furthermore, laser skin resurfacing allows an individual to remove damaged skin and allow the underlying skin to regrow. Sculptra: Sculptra offers an injectable treatment that helps an individual replace the loss of collagen – with treatment results that may last for more than two years. Ultherapy: As part of an Ultherapy treatment, Dr. Azizzadeh will use ultrasound technology to lift and tighten the skin and stimulate collagen growth. For individuals in their 40s, there is no shortage of facial rejuvenation treatments. During a consultation with Dr. Azizzadeh, an individual can learn about all of the facelift treatment options that are available. And ultimately, this individual will be able to select a facelift treatment that will deliver the best results for their unique needs. For women, the ideal time to undergo facelift surgery is usually in their mid-40s to late 50s. Meanwhile, for men, the best age for a facelift is generally in their 50s or 60s. Dr. Azizzadeh believes how a person looks and feels – not his or her age – are the primary factors to consider relative to facelift surgery. For example, if a 40-year-old is unhappy with his or her facial appearance, now may be a good time for a facelift. Or, if a person in his or her 60s experiences sagging facial skin, facial wrinkles and other signs of aging, facelift surgery can treat these issues. Dr. Azizzadeh offers facelift procedures to patients across a wide range of age groups. He also requests a patient consultation to ensure a patient – regardless of age – is a good candidate for facelift surgery. The results of a facelift typically last up to 10 years. But it is important to keep in mind that each facelift patient is different, and treatment results sometimes vary. Dr. Azizzadeh wants each patient to enjoy his or her facelift for as long as possible. To deliver long-lasting results, Dr. Azizzadeh tailors each facelift surgery to his patient. This approach allows Dr. Azizzadeh to determine how to help a facelift patient achieve the optimal treatment results. A mini facelift is a type of facelift surgery designed for individuals who experience mild jowling and sagging skin. Like a traditional facelift, a mini facelift tightens facial tissue. Comparatively, a mini facelift involves the use of shorter incisions than those used during a conventional facelift. These incisions are generally placed above the ears and enable a surgeon to address jowls, enhance the jawline and revitalize the facial appearance. What do they do in a facelift? During a facelift, a surgeon first makes an incision in the front of a patient’s ear; this incision extends from the hair or hairline to the hair-bearing scalp. Then, a surgeon gently pulls the skin upward, removes excess skin and tightens facial tissue. A surgeon next closes the sutures. In some instances, a drain may also be placed under a patient’s skin; this drain helps eliminate excess blood and fluid. Dr. Azizzadeh prepares each facelift surgery patient for treatment. He responds to a patient’s facelift concerns and questions, ensuring this individual understands what to expect before, during and after surgery. Plus, Dr. Azizzadeh requests follow-up appointments after a facelift to ensure a patient’s recovery stays on track. If a person is considering a facelift at 40, Dr. Azizzadeh is happy to meet with this individual and help him or her analyze various facial rejuvenation treatment options. To find out more, please contact us today at 310-657-2203 to schedule a facial rejuvenation treatment consultation with Dr. Azizzadeh.